Request message text to notify user via UI or/and TTS message about some event is happening. Message text may also be requested for some specific dialogs on HMI which require user’s answers. Notify user according to HMI flow via UI pop-ups or/and TTS messages, the text for them obtained in GetUserFriendlyMessage response in correspondence to messageCodes requested. 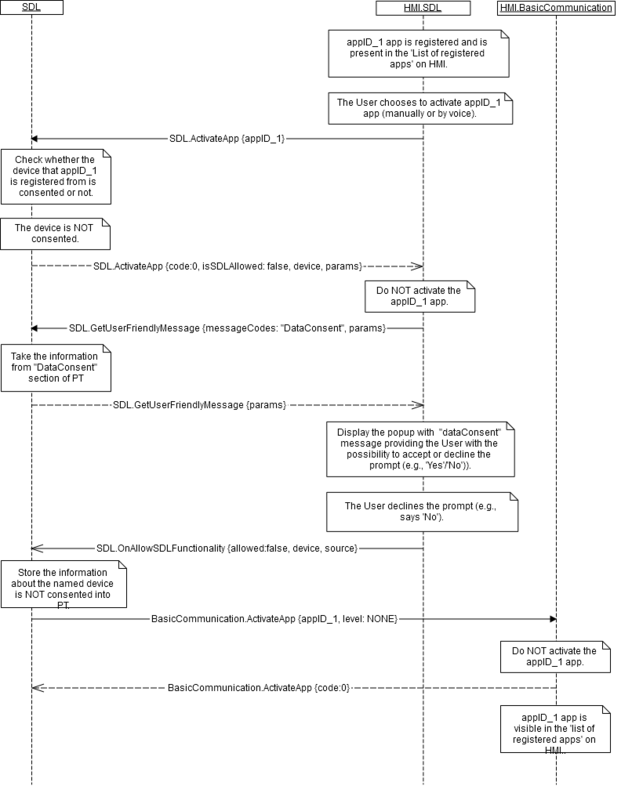 - provide this message via SDL.GetUserFriendlyMessage_response to HMI. - provide this message via GetUserFriendlyMessage response to HMI. Message codes specify appropriate user messages which notify the user about some events/conditions on HMI. Messages and message codes are coming from Policy Table and must be used on HMI in different information pop-ups according to HMI use-cases scenarios. AppPermissionsHelp appName is requesting the following vehicle information and permissions: functionalGroupLabels. You can change these permissions and hear detailed descriptions in the mobile apps settings menu. Please press 'yes' to grant permissions or 'no' to deny. AppPermissionsRevoked App authorizations have changed. appName can no longer access functionalGroupLabels. Please, make sure you have the most recent app version installed on your mobile device. AppUnauthorized This version of appName is not authorized and will not work with Applink. Please update to the latest version of appName. AppUnsupported Your version of appName is not supported by SYNC. DataConsent Would you like to enable Mobile Apps on SYNC? See your Owner Guide for more information. DataConsentHelp Updates are about the size of an email, and the occurrence of updates depends on your vehicle usage and when a new app is found on your device. See your Owner Guide for more information. DisableApps Disabling automatic updates will also disable sync mobile apps. You will not be able to use any mobile apps with SYNC. Please press yes to confirm or no to cancel. DrivingCharacteristics An app can access the following driving characteristics: Fuel Consumption, MyKey, Seat Belt Status. Location An app can access vehicle GPS and speed. Notifications An app can send notifications when running in the background. SettingUpdateAuto Select Update now to receive app authorization information for your SYNC-enabled mobile apps. This may enable additional functionality depending on the app and your settings. If your phone has a working data connection, an update should complete in less than 1 minute. VehicleInfo An app can access the following vehicle information: Fuel Level, Fuel Economy, Engine RPMs, Odometer, VIN, External Temperature, Gear Position, Tire Pressure. “MessageText” column specifies the messages just for an information purposes. The MessageText received from SDL may differ from listed in the table.